1976 - race | Yamaha Motor Co., Ltd.
View an archive of races Yamaha competed in 1976. Yamaha suspends team entry, and Cecotto takes 2nd in Le Mans. In 1976, Yamaha decided to stop all race activities by works teams except those in Japan because of the global economic downturn. The much talked about rider in the opening round in France was Venezuelan Johnny Cecotto. Riding the YZR500 (0W23), Cecotto took 2nd place behind top championship contender, Barry Sheene (Suzuki). However, Suzuki's dominance continued. They took eight wins in the 10-race series, while MV Agusta and Yamaha only managed one win each. 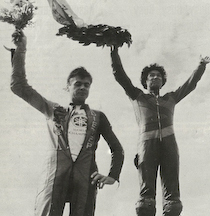 Both the manufacturer and the rider titles went to Suzuki, and Sheen was crowned rider champion. Yamaha's only win came in the fourth round, the Isle of Man TT, won by Ireland's Tom Herron riding a modified version of the TZ350. In the Isle of Man TT race held June 5-11, British rider Chas Mortimer won the 350cc class race. Yamaha riders dominated the Isle of Man by also winning in the 500cc and 250cc classes. In addition to this, five of the 10 races in the series were won by Yamaha riders, giving Yamaha its third successive manufacturer's title. At the Sweden GP T. Katayama won and D.Braun 2nd. In the 250cc class of the Isle of Man TT race, Irishman Tom Herron took the checkered flag in 1st position on a Yamaha. This gave Yamaha a clean sweep of all three classes of the TT this year. In the 250cc class, privateer Takazumi Katayama finished 2nd in the ranking after winning one race along with other strong results.